Apple finally releases AirPods 2 that now features H1 chip, hands-free Siri, better battery life, but no new design. This new AirPods looks similar to the previous generation AirPods model but with the improvement under the hood. It now comes with H1 chip for improved pairing speed and always on “Hey Siri”. For the first time, the new AirPods also comes with a wireless charging case that can be charged wirelessly with any wireless charger. 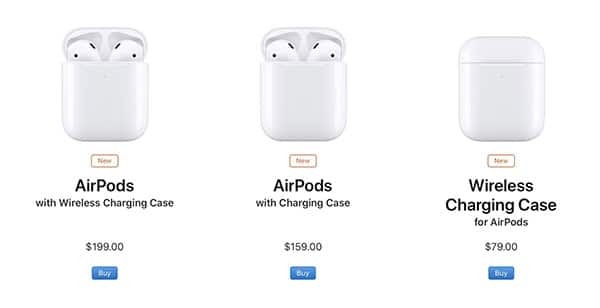 As for the price, it costs the same as the previous generation AirPods that does not include the wireless charging case but if you want the wireless charging case then you need to add $40 more. Also if you would like to add a wireless charging case to your old AirPods, you can buy it separately for $79. You can pre-order the new AirPods via Amazon today and will be available on March 26.